I have always thought Tuesday church sounds like a good idea. Bob Jackson mentioned it to me 7 years ago as the next big thing for London… with people away so much at the weekend why not put on food after work, run with some worship, informal teaching and a lot of community building fellowship and see how many people out there would find that to be their natural home congregation. Yesterday took Tuesday Church to a whole new level for me. To be fair this one is usually held on a Thursday, but they moved it especially so that we could be involved on what is only a 4 day visit here in Rukunguri. To imagine this Tuesday Church where vibrant passionate men of all ages outnumber the women by 3:1 you first have to imagine the sounds… beating African drums lined up in a row, rhythmic clapping, and male voices lifted on high soaring to the heavens. The men, all dressed in yellow, lift their voices in response to their cantor, and as these 80-90 men are singing out in the open air they can be easily overheard by passersby and tradesmen in the bustling city. The view in front of them is of distant green and fertile hills winding down to the rift valley region. The view behind them a high wall with barbed fencing on the top. When they sit half of them sit on benches and half on the floor. But when they stand they shout Hallelu-JAH and they dance so freely it is invigorating to see. The women all sit some distance away from them, also dressed in yellow. A few of them have young children at their feet, the only kids in this church. The setting is the Rukunguri Prison, and if you saw a video of this at our church weekend away you will have had just a little taste of this most fantastic of churches. Men and women stood up to testify about God. Their faith utterly compelling, grounded, real and authentic. The first man, who seemed to stand spiritual head and shoulders above many of us ordained, told us that he had been in since 2004. Before that he had wandered the street, done little of merit, before committing some crime for which he got 20 years inside. He thanked the community church, he thanked the Lord, (later in the service he even thanked the prison guards, accompanied by drums, thanks and clapping from his flock), a sister stood up and did the same, and then the choir sang a song of freedom in English, and one in the local tongue asking the unconverted in the congregation to turn to Christ. (“Oh preacher / Oh officer / Oh prisoner – you’ll never get to heaven unless you enter through the narrow gate”). Women, some with stories too sad to tell, also come over from their side of the prison for the services. Speeches, songs and Oscar worthy thankyou speeches abounded – from community church pastors, officers, and from prisoners. The ‘Mama’ from the community church (Senior Pastor’s wife – who had just the previous night adopted two twin babies, while her husband was 2 weeks into a 5/6 tour of the USA!) gave her benediction to much acclaim. I did a talk through our translator, and Simon stood up to introduce himself with arm raised in the air and a loud shout of PRAISE the LORD presumably a liturgical variation he is planning on bringing back to our 9am service. This afternoon I was driving in town when I saw one of the prisoners walking along the road selling baskets (like the ones some of you bought at Christmas). Having been to the prison every Thursday for the past three years I have become familiar to them, and many of them are familiar to me. I stopped and chatted to him. This was super special because normally we aren’t allowed to talk one to one with the prisoners. He has been in prison for 15 YEARS, since he was 19 years old. He’s now 34. He has the most incredible outlook on his life up to now. He said when he was 19, he was sleeping around, drinking, fighting. When he was sentenced to prison, he was tested for HIV and genuinely shocked to find out that he was negative. He had only completed school up to P4 (year 4). He said his years in prison saved his life. He said his friends of those days have died. He managed to complete his O levels in prison. He came speaking no English but now he translates sermons into English!! He came to faith in prison. He said his first priority is to get baptised by full immersion. Secondly, he wants to be an evangelist. Thirdly, he wants to go home wearing a suit. Fourthly he wants to start a business. Fifth he wants to get married and have children. I became so humbled when he said he was selling the baskets in order to buy the suit for his release. I promised him right there and then that when he gets released, he should call me and I will buy him a new suit from town. This man quoted the scripture that “God works all things together for the good of those who love him and are called according to His purpose”. He isn’t bitter about his time in prison. He doesn’t feel like he has lost years, but rather he says he has gained a whole new life and identity, on this earth and for eternity. He says he would be dead if it wasn’t for his time in prison. He says he would never be speaking English or preaching the gospel if it wasn’t for his time in prison. He knows that God has worked his life for His good and His glory. He said that the past 15 years of suffering (Ugandan prisons are NOT nice) have been worth it. I have as many questions as anyone about “the problem of suffering” and the theology around it. But this conversation today showed me that God really has worked for good in this mans life. Okay, it took 15 years in prison. But I know he will come out of prison in October and change lives as he has also been changed. His outlook has challenged and inspired me and I am excited to see how his future pans out! It is hard to put into words just how wonderful this church is. Many of the inmates are in without trial, some have certainly been wrongly imprisoned, some have been tragic victims of corrupt power. I heard yesterday elsewhere about 2 teenage child rapists who got off scot free because of a parental bribe. Those inside tend to be those who had little power to begin with, but inside through the church have in the words of Mama ‘become Big men – even in here’. It’s a simple step from being a street kid to incarceration. It’s an extraordinary step to become an incarnation of Christ in that incarceration. I have visited many prisons in the UK – all far better equipped and secure (though none with the inspiring views), but I have never seen anything like this even in the most inspiring of prison chaplaincies/alpha stories. At one point the the head of choir asked all those who were pastors in the Rukuguri prison to stand up. 20 inmates stood! They are organised, dedicated, loving the word of God, prayerful, keeping up hope, and inspirational. So much so that Mama charged them when they got out to spread the news of God to the people in the town who did not know God as they did in there. “Mama” this incredible lady has 3 children and has adopted two more, while her pastor husband is in the USA on mission trip. Leadership in Uganda is definitely on a pedestal. Seems nice at first, but a very high standard to live up to and impossible series of expectations to keep. We finished with a presentation of further benches from the church, which all ended up going to the ladies! Having been inspired by the leaders of the community church and prison church my next appointment was no less incredible. I sat over lunch with a young woman who had been visiting Uganda for the past 10 years, since she was a teenager on a mission direct trip with her parents. As a six-year-old she had received a prophesy that she might life abroad, but through a bumpy path in childhood, teenage years and beyond had become a Christian, but, like many of us, had never properly surrendered her whole life to God. At the end of University in England, (where she had read African Studies, inspired by her now repeated trips), she found herself in Chiswick, coming to nanny for a young family in a vicarage and do the New Wine Discipleship Year. 20 months later she spring-boarded back to Africa certainly more secure in her faith and ready to follow God more, but still conflicted, like most of us, as to what she wanted for herself, and what she was prepared to give to God. The work was hard, and demanding, but rewarding and she was a natural in now familiar settings, helping with projects, people and rescuing children from the street by sheer perseverance, prayer and passionate energy for them. And then she met the one she couldn’t reach. Hidden, alone, afraid, the young deaf girl ‘Princess’. 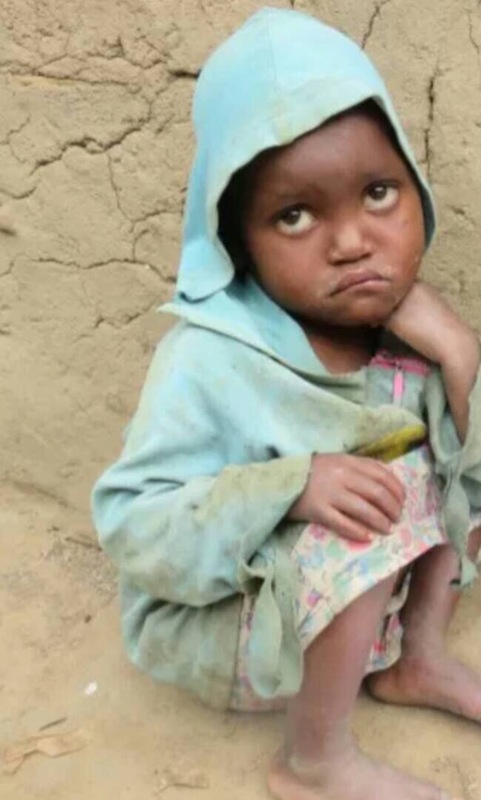 This unsmiling, sad-faced, lost, frightened, withdrawn, depressed girl had been abandoned by her overwhelmed teenaged mother and left by relatives in their hut in a plantation grove day by day – ill equipped as they felt to care for someone unable to respond to the little they had to give her. Somehow that little girl reached into Emily’s heart more than anyone else had before. The full story is not mine to tell, but Princess has been used in her brokenness to grant Emily the full brokenness by which she could be changed too. I don’t know if any of her relatives might read this, but if you do, and don’t yet understand all she has been called to be, do come over here some day and see. If you watch Emily walking around here now she is already (as I have heard several locals tell her) almost an African. A natural bridge builder, community former, faith stirrer and willing servant of many, she has come to know God in a whole new way these past few months and years and stands now as a pastor among a people who have many other pastors too. By no means perfect (she will be horrified to get this much praise, and won’t see it in herself so easily), It is nevertheless the sort of extraordinary journey a church or a New Wine hub dares to dream of when interns join their ranks and they have their first stumbling prayers together. It is a story of God’s breakthrough, intervention and love, albeit coming at a great cost in tears and sobs. Thank you, Lord God for Emily. I walked away from this conversation full of hope and joy for all God might do next in Emily’ life here in Africa. I don’t know if any of her relatives might read this, but if you do, and don’t yet understand all she has been called to be, do come over here some day and see. What others might not stomach (literally!) for more than a day or three, she has grace for for a long haul, and not just grace, inspiration! It inspires her, and it inspires those around her. It is a joy to behold. I made my way up the hill to the parish church complex where I had arranged to meet the young curate who impressed me on Sunday. He had a wonderful story to tell of God bursting into his life as a 17-year-old, completing his school studies thanks to a Compassion UK sponsor. In a queue one day prayer ‘just came upon him’. He found himself praying without being able to stop for an hour as the Spirit of God overwhelmed him. At the end he spoke all the words he can remember ‘God I believe, I trust you’ and from then on was headed for ordination. We spoke of the East African revival, that had begun in 1935 when a missionary landed, saw the poor state of religion, synchronised as it was with the prevailing culture in a way that reminds me of our current UK church. This man was devastated by what he saw and went around preaching for an uncompromised faith, which coupled with two prayer movements here and in Rwanda led to an incredible move of God that changed Uganda in extraordinary ways. UK wide revival. Do it again please dear Lord. Following this it was heart-warming to see the new Chilli Children centre, and meet the staff gearing up for tomorrow’s opening. More on that tomorrow…. The later afternoon was a field visit to Princess’ family, which has become a regular retreat and sanctuary for Emily. These villages are beautiful, remote and poor, but life giving in a way that urban poverty is often not. It is inspiring to take in the views, sit with a family increasingly comfortable with itself, and breathe the stunning air in the warm evening sunshine. We gave uniforms and clothes donated from Chiswick and played with bubbles, balloons and made silly films on my phone. I wish I’d brought bags more clothes… the transformation of seeing a ragged dress swapped for a Tesco school dress was incredible. Clothes swap! Thanks to all in W4 (spot the New Wine teeshirt at least one kid came to faith in). On Thursday Princess (aged 7) will begin at the best deaf school available. It is four hours drive away and she will not understand what is going on as she begins to board there. Emily will teach the family Ugandan sign language while she is gone… please pray for a miracle there. It is a new era and time for her to have a fuller chance to fly. The evening was spent pleasantly with British volunteers/staff at Mission Direct, and the knowledge that I have had a surprise invitation from my translator at the prison to speak at a businessmen’s breakfast tomorrow morning at 6am. That will be a wonderful opportunity to speak to people who might be entrepreneurial creatives in a town and area that certainly needs visionary leaders able to work for the good of the whole of society.